1. Combine the rice flour, sour curd and salt. 2. Mix well to a thick mixture. 4. Fry the mustard seeds and urad dal for 45 to 60 seconds. 6. Add asafoetida powder and red chilli powder to the rice flour – curd mixture. 7. Add this to the pan and cook till it starts to have a regular upma consistency. Tip: You can also add chopped carrots and green peas if desired. 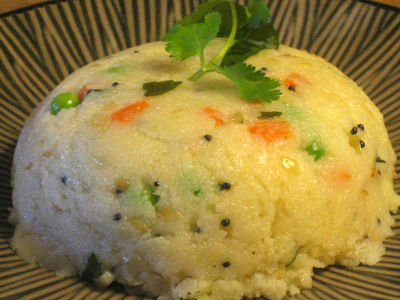 Feel free to comment or share your thoughts on this Instant Upma Recipe from Awesome Cuisine.